It takes a while to boot into the liveDVD, but I AM running it in a VM. I was autologged into the distro. The distro is, obviously, in Spanish. 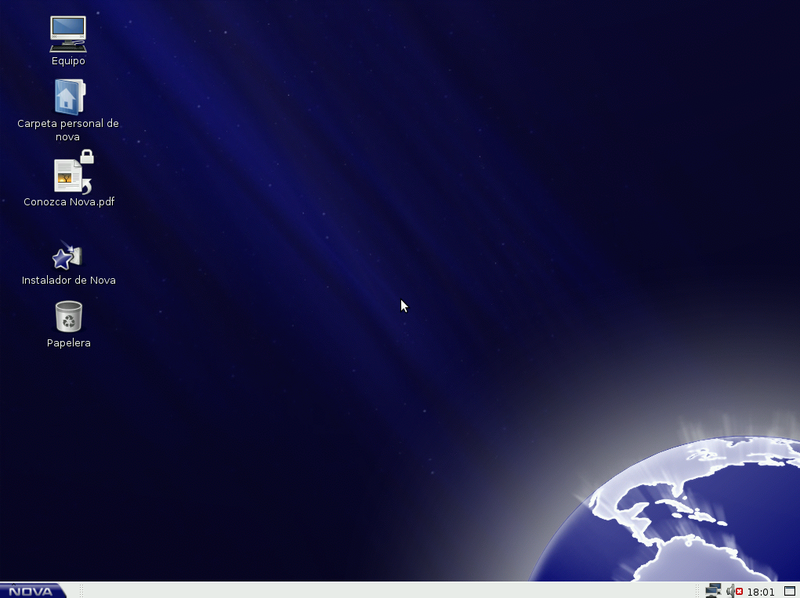 A little less obvious is the fact that it’s running Gnome given how it’s been customised. Notice the globe on the bottom right? Not the usual angle for a globe image; hehe. So let’s see what programs are running on the LiveDVD. Interestingly, the GIMP is missing. Pidgin is available for IM, but strangely they’ve gone with Bon Echo, the development version of Firefox, for the Browser. For Office applications they have Open Office.org and Evolution. For multimedia they have VLC and audacious. So it’s a pretty bare LiveDVD, but I assume there is either more available on the DVD or in the repos. 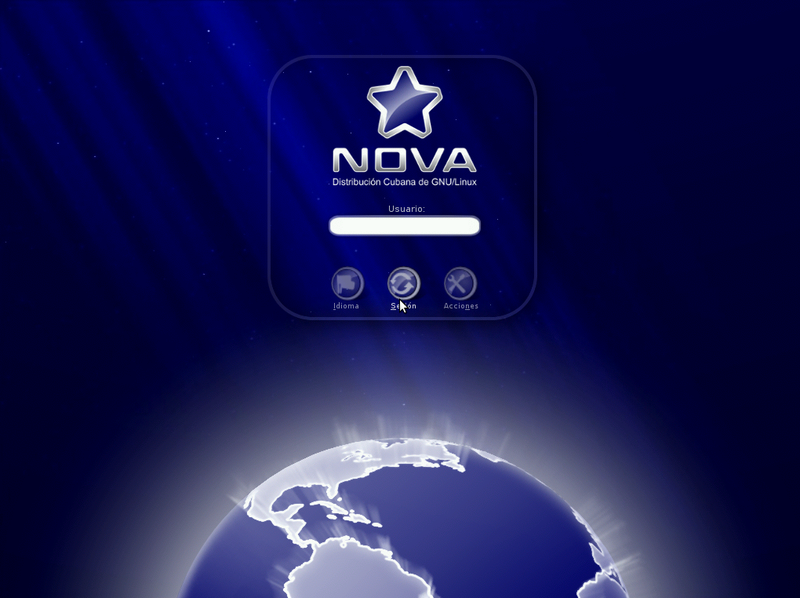 There is also a PDF on the desktop that translate to “get to know Nova”. It’s 17 pages long and I’m not really that good in technical Spanish. So I’ll leave that to the enterprising reader. OK! Let’s get installing! I double-click the installer. Here it gives me the option to do a manual or automatic install. Manual lets you set the mount points and have more control over the partioning. I choose automatic and then choose my timezone. I then confirmed the hard drive, gave it a hostname, and put my username and password. Then the disc formatting began. I boot in and see if there are more programs installed than on the LiveDVD. Nope! Same programs installed. Odd since it’s a DVD, but whatever. I decide to update. 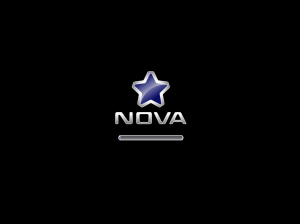 I eventually find it under “Centro de Control de Nova” (Nova Control Center). The “gestor de paquete” is the package manager. The bad thing is that the repo is set to the DVD. So I go on Google to try and find the repo. No love there. I couldn’t find the repo in the “getting to know Nova” pdf on the desktop either. I found the page “first steps with Nova” which appeared to list an ftp site, but it was not responding to pings when I did this review. That same page mentioned that most of the repos were on the DVD. So now I needed to figure out how to properly set that up again. Unfortunately, that program keeps freezing up now. In the beginning of this review I wondered if this distro would take the good parts of the Gentoo distros or the bad parts. Overall, the Cubans appear to have come up with a pretty good distro. I didn’t have any of the installation issues of Gentoo. I liked the polish a bit more than Sabayon. I’ve never used Ututo, so I’m not sure what they took from there. 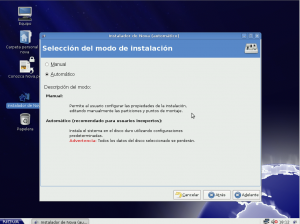 Really, it appears that there is just one problem with recommending Nova Linux to anyone outside of Cuba and that is that there doesn’t appear to be a way to update the distro. Even if there are tons of packages on the DVD, those will eventually need to be patched because of security holes. Firefox, itself, has been patched a few times since this release. I’d like to see some of the ease of use improvements roll back upstream to Gentoo, Sabayon, and Ututo. Overall, not a bad distro and I’ll keep my eye on it. very strange name for a country that speaks spanish. 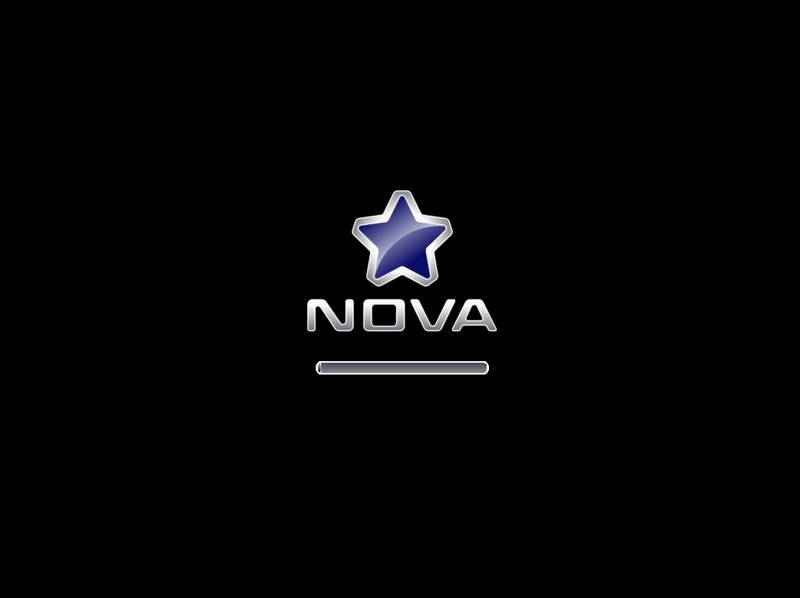 NOVA = NO VA = NO GO. Anybody remember the Chevy Nova marketing debacle (back in the 70’s, I think)? Yeah, I kept thinking of that too. But I think the Chevy thing is apocryphal. I am a Spanish native speaker and I didn’t even think of that “no go” think, mainly because there is a clear difference in how it is pronounced. Of course, if one wants to find ways to insult a product there are always creative ways of doing it, no matter what name it is. About the repos, they say in their webpage that they are trying to get the infrastructure for doing them. It’s Cuba after all.